OhioHealth Grady Memorial Hospital recently held its Light Up A Life event to benefit OhioHealth Hospice. 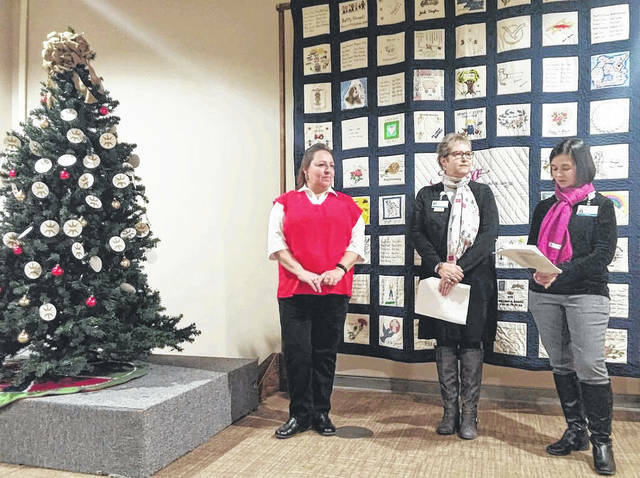 From left to right, Donna Lowther, Pamela Gompf from OhioHealth Hospice, and Betsy Ralley, philanthropy director at OhioHealth Grady Memorial Hospital, participated in the event. For some in Delaware County, Light Up A Life has marked the beginning of the holiday season. Each year the memorial event at OhioHealth Grady Memorial Hospital celebrates the lives of loved ones who have died, while raising awareness and financial support for OhioHealth Hospice. Families purchase special ornaments, with their loved ones’ name on it, and place it on the tree. One of the most special parts of this very personal and emotional event is the person selected to light the tree. This year, that honor went to Donna Lowther, an OhioHealth associate who worked as an aide for about a decade within OhioHealth Hospice. Lowther, during her years with OhioHealth Hospice, watched many families get the comfort and care that many times can only come from a full hospice team. Each time she came into a home to work with a family receiving hospice care, she always took that to heart. Tina Null is the OhioHealth Hospice director. She says there are many events that are truly special, but with this time of the year, in a community like Delaware County, she is especially touched by the response. “I think it has a tremendous impact on the residents of Delaware County. But beyond that, I think it has an impact on the staff members who attend from Grady Memorial, and those from our hospice and bereavement services teams,” Null said. It’s been an emotional time for Lowther. Losing loved ones very close to each other this year. An event like this, brings a lift to her spirit. A light that she says she needed. “Oh my goodness. I’m here to tell you when they called me to do this, it brought me to tears. I had no idea. I feel blessed to be part of the OhioHealth family,” Lowther said. It’s a feeling of support Null hopes lasts well into the holiday season and beyond for anyone who has lost someone special in their lives. “This time of year especially, when so many people remember those they have lost, it’s events like this that can really make a difference. We are proud to be a part of it, and I was honored to be there for the event this year,” Null said.